The BRCA1 gene plays an important role in the maintenance of genomic stability. BRCA1 inactivation contributes to breast cancer tumorigenesis. An increasing number of transcription factors have been shown to regulate BRCA1 expression. c-Myc can act as a transcriptional activator, regulating up to 15% of all genes in the human genome and results from a high throughput screen suggest that BRCA1 is one of its targets. In this report, we used cultured breast cancer cells to examine the mechanisms of transcriptional activation of BRCA1 by c-Myc. c-Myc was depleted using c-Myc-specific siRNAs in cultured breast cancer cells. BRCA1 mRNA expression and BRCA1 protein expression were determined by quantitative RT-PCR and western blot, respectively and BRCA1 promoter activities were examined under these conditions. DNA sequence analysis was conducted to search for high similarity to E boxes in the BRCA1 promoter region. The association of c-Myc with the BRCA1 promoter in vivo was tested by a chromatin immunoprecipitation assay. We investigated the function of the c-Myc binding site in the BRCA1 promoter region by a promoter assay with nucleotide substitutions in the putative E boxes. BRCA1-dependent DNA repair activities were measured by a GFP-reporter assay. Depletion of c-Myc was found to be correlated with reduced expression levels of BRCA1 mRNA and BRCA1 protein. Depletion of c-Myc decreased BRCA1 promoter activity, while ectopically expressed c-Myc increased BRCA1 promoter activity. In the distal BRCA1 promoter, DNA sequence analysis revealed two tandem clusters with high similarity, and each cluster contained a possible c-Myc binding site. c-Myc bound to these regions in vivo. Nucleotide substitutions in the c-Myc binding sites in these regions abrogated c-Myc-dependent promoter activation. Furthermore, breast cancer cells with reduced BRCA1 expression due to depletion of c-Myc exhibited impaired DNA repair activity. The distal BRCA1 promoter region is associated with c-Myc and contributes to BRCA1 gene activation. The human breast cancer susceptibility gene 1 product, BRCA1 is involved in important cellular processes, including DNA repair, and loss of BRCA1 can result in genomic instability. Loss of BRCA1 expression occurs in a subset of breast cancer cases, and inherited mutations of the BRCA1 gene account for about 5% of all breast cancer cases [1–8]. The regulation of BRCA1 expression has been studied extensively, including investigations of alternative mechanisms for reduced expression of BRCA1 in sporadic cases [9, 10]. A set of transcription factors and/or co-factors has been shown to regulate BRCA1 expression through a region in close proximity to the BRCA1 transcription start site. This proximal promoter region of BRCA1 is bidirectional and includes a 218 bp intergenic region between the BRCA1 and NBR2 genes . Within this region, it has been demonstrated that a short segment (-204 to -148) relative to BRCA1 exon 1a start site may be responsible for BRCA1 promoter activities . Another report confirmed these findings using a different strategy of deletion analysis and showed that a slightly shorter region (-202 to -166) was required for BRCA1 promoter activation [13, 14]. Further studies of this region (-202 to -166) revealed two sub-elements: 1) a RIBS element (-204 to -182) that binds to and is activated by a GABPα/β complex  and 2) a CREB/ATF1 element (-174 to -167) that acts as a constitutive transcriptional activation element bound by CREB [16, 17]. In addition, the E2F family of transcription factors binds to two regions, -41 to -31 and -21 to -11, and activates or represses BRCA1 expression depending on the co-factors recruited [18, 19], BRCA1 itself has been shown to be one of the co-factors . An element (-40 to -25) that overlaps one of the E2F binding sites can be bound and activated by 53BP1 in a sequence-specific manner and functions as a positive regulatory element . An ER-α transcription complex binds an AP1 element (+246 to +250) and activates BRCA1 transcription upon estrogen stimulation . This ER-α dependent activation can be modulated by an aromatic hydrocarbon receptor complex that binds two consecutive xenobiotic-responsive elements located upstream of the ER-α binding region (+17 to +21 and +175 to +179) . A relatively long segment in a 5 kb region in BRCA1 intron 2 that is highly conserved in multiple species contains a CNS-1 (Conserved Nucleotide Site-1) and CNS-2, which appear to act as repression and activation elements, respectively . c-Myc is a transcription factor involved in growth, proliferation, differentiation, and apoptosis of cells and regulates up to 15% of human genes . c-Myc regulates transcription through several mechanisms, and cis-regulatory elements modulate specific subsets of c-Myc targets. One of the cis-regulatory elements, E box, is common in c-Myc targeted genes . Serial analysis of gene expression performed after adenoviral expression of c-Myc in primary human umbilical vein endothelial cells has implicated BRCA1 as one of the activated gene targets for c-Myc . However, it was not clear whether c-Myc could transcriptionally regulate BRCA1 expression through a cis-regulatory element, particularly in breast cancer cells. In this report, we show that depletion of c-Myc is correlated with a reduction in BRCA1 mRNA and BRCA1 protein levels and decreased BRCA1 promoter activities were observed in the cells following depletion of c-Myc. On the other hand, ectopic expression of c-Myc activated BRCA1 promoter activities. DNA sequence analysis revealed two novel E boxes within the distal BRCA1 promoter. A chromatin immunoprecipitation assay demonstrated that c-Myc binds to these E boxes in vivo. Furthermore, we show that BRCA1 promoter/reporters containing nucleotide substitutions in these E boxes abrogate their c-Myc dependent activation. These data suggest that c-Myc activates BRCA1 expression through the E boxes in the distal BRCA1 promoter region. Finally we observed that cells treated with c-Myc specific siRNAs had reduced DNA repair activity, a biological process associated with BRCA1. Breast cancer cells were obtained from the American Type Culture Collection (ATCC, Manassas, VA). MCF-7 cells (ATCC: HTB-22) were cultured in DMEM (Mediatech, Inc., Manassas, VA) supplemented with 10% fetal bovine serum (Lonza, Inc, Allendale, NJ) and 1% antibiotic-antimycotic solution (Mediatech Inc.). MDA-MB-231 cells (ATCC: HTB-26) were cultured in RPMI1640 (Invitrogen, Carlsbad, CA) supplemented with 10% fetal bovine serum (Lonza, Inc.) and 1% antibiotic-antimycotic solution (Mediatech, Inc.). A vector containing human c-Myc cDNA was obtained from ATCC (ATCC: 5233860) and used to construct a c-Myc-GFP expression vector designated pMYC-GFP. The full length c-Myc protein coding DNA fragment was inserted in the 5' end of GFP under the control of the cytomegalovirus (CMV) promoter. First the full-length coding region of c-Myc was amplified by PCR using primers (5'-TCCCGCGACG ATGCCCCTCA ACGTTAGCTTCA-3' and 5'-CACAAGAGTT CCGTAGCTGT TCAAGTTTGTG-3') and the c-Myc cDNA vector (ATCC 5233860) as a template. Then the PCR products were cloned into pcDNA3.1/CT-GFP-TOPO (Invitrogen) following the manufacturer's protocol, yielding pMYC-GFP. The c-Myc encoding sequence was confirmed by DNA sequence analysis to be identical to that of GenBank: BC000917. A promoter/luciferase reporter construct containing the BRCA1 promoter region (-1714 to +42) in pGL4.10 (Promega, Madison, WI) was generated as follows. The required BRCA1 promoter region was amplified by PCR using the primer pair: 5'-CTA GGTACC TTGGGAGGGG GCTCGGGCAT GGC-3' and 5'-CAT AAGCTT CCAGGAAGTC TCAGCGAGCT CACG-3' (KpnI and HindIII sites were underlined, respectively) and human placental genomic DNA (Sigma-Aldrich, St. Louis, MO) was used as a template. The PCR products were digested with KpnI and HindIII, and the resulting fragments were inserted into pGL4.10 at identical sites. The resulting construct was named pCYL42. The inserted DNA sequence of the BRCA1 promoter was determined to be identical to that of GenBank: L78833 by DNA sequence analysis. We used a QuikChange Site-Directed Mutagenesis Kit (Stratagene, La Jolla, CA) to generate E box nucleotide substitutions following the manufacturer's protocol. To generate single E box nucleotide substitution constructs, we used pCYL42 as the original template and corresponding E box mX and E box mY primer pairs. The primers (sense strands shown) used are shown below with nucleotide substitutions underlined: E box mX: 5'-AGATTGGCTC TTACAAAATG TCCCTCAAAA CGAC-3'; and E box mY: 5'-GCGAGGGCTG CTAGAAAATT GTCACCTCGC ATTCT-3'. To generate the double E box mutant, the mutagenesis reactions were conducted using the primers E box mX and E box Y nucleotide substitution constructs as templates. All constructs were confirmed by DNA sequence analysis. The pMyc-TA-Luc and pTA-Luc plasmids used as c-Myc activated promoter/luciferase controls were purchased (Clontech Laboratories, Inc., Mountain View, CA). The pMyc-TA-Luc vector is a derivative of pTA-Luc and contains six tandem copies of the E box consensus sequence (CACGTG) located upstream of the minimal TA promoter, followed by the firefly luciferase gene. All related reagents, including c-Myc siRNAs, control siRNA, and transfection reagents, were purchased from Qiagen (Valencia, CA). Transfections were performed according to the manufacturer's protocol. Total RNA was extracted from cultured cells using the RNeasy mini kit (Qiagen). Reverse transcription reactions were performed with the SuperScript III First-Strand Synthesis System (Invitrogen) using 1 μg of DNase-treated RNA and oligo (dT) primer. Real-time PCR was performed in a Light Cycler (Roche Diagnostics, Indianapolis, IN) using the LightCycler FastStart DNA Master PLUS SYBR Green I kit (Roche Diagnostics). Primers for BRCA1 and glyceraldehyde-3-phosphate dehydrogenase (GAPDH) were used as previously described [9, 28]. Thermal cycling for amplification of BRCA1 or GAPDH was initiated by heating at 95°C for 10 min, followed by 40 cycles of denaturation at 94°C for 10 sec, annealing for 10 sec at 54°C and 57°C for BRCA1 and GAPDH, respectively, and elongation at 72°C for 15 sec. After completion of the PCR cycles, melting curve analyses and electrophoreses of the products on 2% agarose gels were performed to validate generation of each specific, expected PCR product. The fold change in BRCA1 cDNA (target gene) relative to the GAPDH control was determined by the 2-ΔCt method . Experiments were conducted independently twice in triplicate. Western blotting was carried out as previously described . Mouse anti-BRCA1 antibody (AB-4, Oncogene, San Diego, CA), mouse anti-c-Myc antibody (sc-40, Santa Cruz Biotechnology, Inc., Santa Cruz, CA), and goat anti-actin antibody (sc-1616, Santa Cruz Biotechnology, Inc.) were used for western blotting. An ECL western blotting detection reagent kit (GE Healthcare, Buckinghamshire, UK) was used for detection. One day prior to transfection, 6 × 105 cells were seeded into one well of a six-well tissue-culture plate (BD Biosciences, San Jose, CA). After 24 hours, cotransfections were conducted. The transfection mixture contained a promoter/luciferase reporter construct (980 ng), a CMV/renilla luciferase vector, pGL4.75 (20 ng, Promega) as a transfection efficiency control, and an expression construct for c-Myc (pMYC-GFP, 1000 ng or other indicated amounts) or additional control vector pcDNA3.1/CT-GFP (Invitrogen) to give consistent amounts of total vector of 2000 ng. Then 6 μl of FuGENE HD (Roche Diagnostics) was added to the mixture, and cotransfections were done according to the manufacturer's instruction. Forty-eight hours after transfection, cell lysates were prepared using passive lysis buffer (Promega). Luciferase activities in the lysates were measured using a dual luciferase assay system (Promega) with a 1450 microbeta trilux jet scintillation and luminescence counter (PerkinElmer Life and Analytical Sciences, Downers Grove, IL). Experiments were performed in triplicate. In reporter assays with depletion of c-Myc in MCF-7 and MDA-MB-231 cells, 24 hours after siRNA treatment, cotransfections were done using the mixture of pCYL42 (1000 ng) and pGL4.75 (20 ng) combined with 2 μl of FuGENE HD as described above. Luciferase activity was determined 48 hours after the transfection. Experiments were performed in triplicate. Chromatin immunoprecipitation (ChIP) assays were performed following the manufacturer's protocol (Upstate Biotechnology, Lake Placid, NY) using 2 × 106 MCF-7 or MDA-MB-231 cells. An anti-c-Myc antibody (sc-764, Santa Cruz Biotechnology, Inc.) or an anti-CTCF antibody (sc-15914, Santa Cruz Biotechnology, Inc) was used to precipitate DNA-protein complexes, and the normal isotype-matched IgG from the same species was used as negative control. The PCR primers used for detecting DNA fragments containing E boxes are: E box X: ChIPX-FW: 5'-AATGCAAAGA CCGTCCGCTG CCA-3'and ChIPX-RV: 5'-TCCACCCCTC AGCCCCAGTG TTT-3'; E box Y: ChIPY-FW: 5'-TGAAGGGCTC CTCCAGCACG-3' and ChIPY-RV: 5'-TGAGGGACCG AGTGGGCGAA-3', and non E box: ChIPNE-FW: 5'-CGAGAGACGC TTGGCTCTTT CTGT-3' and ChIPNE-RV: 5'-GCCCAGTTAT CTGAGAAACC CCAC-3'. The amplified PCR product size was 233 bps for the detection of E box X, 146 bps for E box Y, and 214 bps for non E box, respectively. The band densities of the targeted PCR products were quantified with the software QUANTITY ONE version 4.5.1 (Bio-Rad, Hercules, CA). We used a fluorescence-based DR-GFP reporter system with modifications [31, 32]. The efficiency of homologous recombination was assessed using a restriction endonuclease I-SceI expression plasmid pCβASce and pDR-GFP, an I-SceI repair reporter plasmid composed of two differentially mutated GFP genes, one of which contained a unique I-SceI restriction site. A double strand break of DR-GFP plasmids created by I-SceI digestion was repaired by gene conversion to produce a functional GFP. The cells expressing GFP, representing homologous recombination activity, were detected with flow cytometry. Briefly, MDA-MB-231 cells were seeded in a well of a six well plate. On the next day, the cells were treated with equal amounts of siRNA against c-Myc or control siRNA with Hiperfect as instructed by the manufacturer (Qiagen). 48 hours later, pDR-GFP plasmid, along with either pCβASce (expressing endonuclease I-SceI to create double strand breaks (DSBs)) or pCAGGS (empty vector) were co-transfected into cells by Fugene HD (Roche) as described above. After incubation for 48 hours, cells were trypsinized, harvested, and finally suspended in PBS. Consequently, the cells were analyzed at the flow cytometry facility of the University of Chicago with a Becton Dickinson FCAScan (BD Biosciences). The channel FL-1 (green) and FL-2 (orange) were recorded and used to calculate the frequency of GFP positive cells. For quantitative RT-PCR, after logarithmic transformation, BRCA1 mRNA level was analyzed using ANOVA. Then the regression coefficients were transformed back to obtain the fold change or geometric mean difference between study groups . Means and standard deviations (SDs) were calculated for relative luciferase activities, densitometry ratios, and homologous recombinant efficiencies. Two-tailed Student's t-tests were used to compare only 2 groups. ANOVA were implemented for comparisons with multiple groups. After the overall analysis, Tukey tests were used to make the pairwise comparison. BRCA1 has been implicated as a c-Myc target in a high throughput study using human umbilical vein endothelial cells overexpressing c-Myc . Whether c-Myc can directly regulate BRCA1 expression at the transcriptional level is not clear. We successfully depleted c-Myc expression in the breast cancer cell lines MCF-7 and MDA-MB-231 through treatment with siRNA against the c-Myc gene. In both cell lines, transient transfection of c-Myc siRNA efficiently reduced c-Myc protein expression (Figure 1A). Correspondingly, BRCA1 protein levels were reduced upon depletion of c-Myc in both cell lines (Figure 1A). More importantly, BRCA1 mRNA levels in cells with depleted c-Myc protein were reduced to 24% in MCF-7 and 36% in MDA-MB-231 compared to the control siRNA treated cells (Figure 1B). To establish that BRCA1 expression was directly modulated by c-Myc through DNA regulatory elements in the BRCA1 promoter region, we constructed a BRCA1 promoter/luciferase reporter vector containing the BRCA1 promoter region -1714 to +42. BRCA1 promoter activity following depletion of c-Myc was significantly reduced compared to control in both cell lines (Figure 1C). These data suggest that reduced c-Myc might decrease BRCA1 expression in these two breast cancer cell lines through the BRCA1 promoter. To test whether this BRCA1 promoter region sufficiently responded to c-Myc activation, we monitored BRCA1 promoter activity in the presence of ectopically expressed functional c-Myc from transient transfections of pMYC-GFP into MCF-7 or MDA-MB-231 cells. We observed increasing expression of the Myc-GFP with increasing amounts of Myc-GFP expression vector used, while the endogenous c-Myc expression remained consistent (Figure 2A). In both cultured cell types, Myc-GFP protein levels produced at the maximal dose of the Myc-GFP expression vector were similar to the levels of endogenous c-Myc at the time when cells were used for luciferase assays (Figure 2A). In the presence of constitutively expressed Myc-GFP, BRCA1 promoter activity increased proportionally to increasing amounts of pMyc-GFP (Figure 2B). Taken together, these data indicated that c-Myc activates BRCA1 expression through the region of the BRCA1 promoter (-1714 to +42), which could contain c-Myc-mediated DNA regulatory elements. Reduction of expressions of BRCA1 mRNA and BRCA1 protein, and BRCA1 promoter activity by depletion of c-Myc in breast cancer cells. (A) MCF-7 or MDA-MB-231 cells were treated with c-Myc siRNA to deplete c-Myc expression, and total cellular c-Myc and BRCA1 protein levels were determined by western blot with actin levels serving as a protein loading control. (B) BRCA1 mRNA expression levels from cells treated with c-Myc siRNA were determined by quantitative RT-PCR. Real-time PCR was performed in two independent experiments in triplicate. Bars show mean ± SE. *: p < 0.01. (C) The BRCA1 promoter reporter vector pCYL42 was transfected into cells with depleted c-Myc by c-Myc siRNA treatments, and BRCA1 promoter activities were recorded. The data were presented as means of control siRNA as 1, bars show mean ± SD. *: p < 0.01. Activation of BRCA1 expression by c-Myc in breast cancer cells. A vector of overexpression c-Myc (pMyc-GFP) and the reporter/luciferase constructs were co-transfected into MCF-7 or MDA-MB-231 cells as describer in methods. The amounts of Myc-GFP expression vectors are as indicated. (A) The constitutively expressed Myc-GFP fusion protein (Myc-GFP) and endogenous c-Myc (c-Myc) from the same amounts of whole cellular protein extracts from each cell line are detected by western blot. Actins are used as the loading control (Actin). (B) BRCA1 promoter activities from whole cell lysates were measured. The luciferase data were normalized to the empty vector and compare to that without overexpression of c-Myc as 1 (column: 0 ng). Bars show mean ± SD. *: p < 0.01 as each indicated column compared to the 0 ng column. c-Myc regulatory sites within gene promoter regions, such as the cognate hexanucleotide E box (CACGTG) and non-cognate E boxes have been well documented, but the DNA sequences of c-Myc binding regions could be more degenerate . In order to identify c-Myc interacting elements, we used these E box sequences to search for possible matches in the -1714 to +42 region of the BRCA1 promoter, which is responsive to c-Myc activation. Two nucleotide regions, -1292 to -1286 (E box Y) and -912 to -907 (E box X), were found to be either identical to or with high similarity to E box sequences (Figure 3A). One nucleotide at position 4 of E box X; (-909: G to T) differed from the cognate E box sequence CACGTG, while seven nucleotides of E box Y were identical to the non-cognate E box sequence CACGTTG. An alignment of the putative E boxes and their adjacent regions is shown in Figure 3B. Almost half of the nucleotides (12 to 30) were identical in two DNA clusters, which indicated that these regions could serve as a tandem array that facilitates c-Myc-containing transcription factor binding (Figure 3B). A diagram of BRCA1 promoter region and the alignment of regions spanning putative E boxes in the BRCA1 distal promoter. (A) The diagram is an illustration only representing E boxes in BRCA1 gene distal promoter and is not to scale. Positions of putative E boxes are marked by boxes with vertical lines, and regions of BRCA1 exon 1a and 1b (partial) are marked by filled boxes. The locations are relative to the transcription start site of exon 1a as +1. (B) Nucleotides that are conserved between two of the E boxes (bold and italic) are shown as the deduced consensus sequence listed below, while variable nucleotides are marked with asterisks: *. The interactions between two E boxes of the BRCA1 promoter and c-Myc were investigated by an in vivo ChIP assay. The cross-linked protein-DNA complexes from cultured cells were immunoprecipitated with an anti-c-Myc antibody, and then DNA fragments were released from immunoprecipitates. The c-Myc-associated fragments were detected by semi-quantitative PCR analysis using primers designed to amplify the regions flanking each E box. 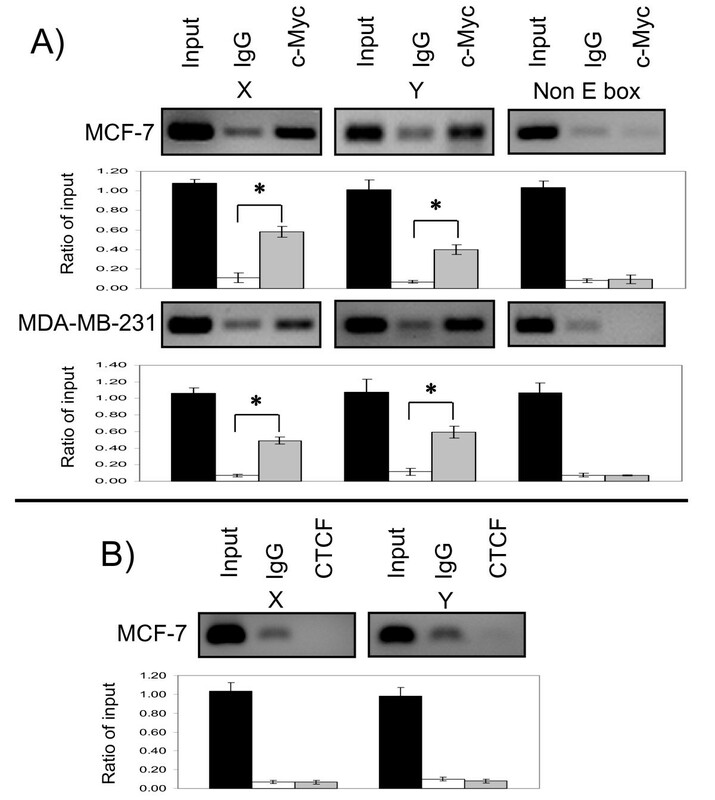 Enrichment in fragments containing either E box X; or E box Y were found in immunoprecipitates treated with an anti-c-Myc antibody in comparison to the control IgG, as detected by semi-quantitative PCR using MCF-7 or MDA-MB-231 cells (Figure 4A, X and Y panels). In MCF 7 cells, there was nearly 4 or 5 fold increase in bound fragments containing E box X; or E box Y compared to the control IgG, respectively as determined by densitometry quantification. 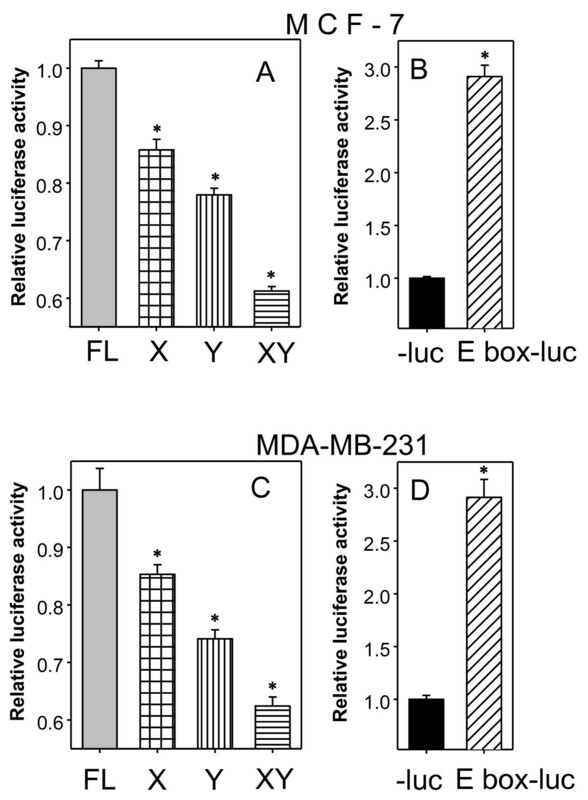 A similar enrichment was quantified in MDA-MB-231 cells; almost 6 or 4 fold more for E box X; or E box Y, respectively. There was no enrichment of PCR products in anti-c-Myc antibody-treated samples with primers designed to amplify a non E box region in BRCA1 promoter region, indicating this region was not associated with c-Myc (Figure 4A, non E box panel). To demonstrate the specificity of the E box X; or Y-c-Myc interaction, we repeated the CHIP assay with CCCTC binding factor (CTCF). CTCF binds to the BRCA1 promoter and plays a crucial role in maintaining the methylation-free state of the functional BRCA1 promoter region . Although CTCF binds to the BRCA1 proximal region as we previous reported , at E box X; or Y there was no enrichment of targeted PCR products when using anti CTCF antibody comparing that of control IgG (Figure 4B), suggesting CTCF was not associated with these E boxes. These data strongly indicated that c-Myc associates with these E boxes in breast cancer cells. c-Myc associates with the BRCA1 promoter regions containing E boxes in vivo. (A) Cross-linked protein-DNA complexes with formaldehyde were incubated with an anti-c-Myc antibody or control IgG. After immunoprecipitation, DNA is recovered from the protein-DNA complex, and the DNA fragments were subjected to PCR with a primer pair specific for detecting the distal BRCA1 promoter regions containing E box X, or E box Y, and indicated as panel X, or panel Y, respectively. Detection of a random region in BRCA1 promoter was shown as non E box panel. (B) An anti-CTCF antibody or control IgG were used for immunoprecipitation of CTCF bound protein-DNA complex, and the DNA fragments recovered were subjected to PCR for detecting regions containing E box X, or E box Y. An aliquot (1%) of total DNA without immunoprecipitation was used for input. The PCR products were analyzed by 2% agarose gel electrophoresis, and stained with ethyl bromide. The cell lines, specific antibodies, and targeted PCR fragments were indicated. The experiments were done three times and all produced similar results. The representative targeted PCR product images are depicted, and bars show mean ± SD. *: p < 0.01 as c-Myc compared to IgG. To determine if c-Myc-mediated BRCA1 activation is dependent on E boxes X; and Y, we generated E box-specific nucleotide substitutions in the BRCA1 distal promoter. The pCYL42 promoter/reporter construct was used as a parental vector and the E box sequences CACTTG (E box X), or CACGTTG (E box Y) were mutated to CAAAAG, or AAAATTG, respectively, with nucleotide substitutions underlined. The BRCA1 promoter/reporter activities were monitored in the presence of constitutively expressed Myc-GFP. 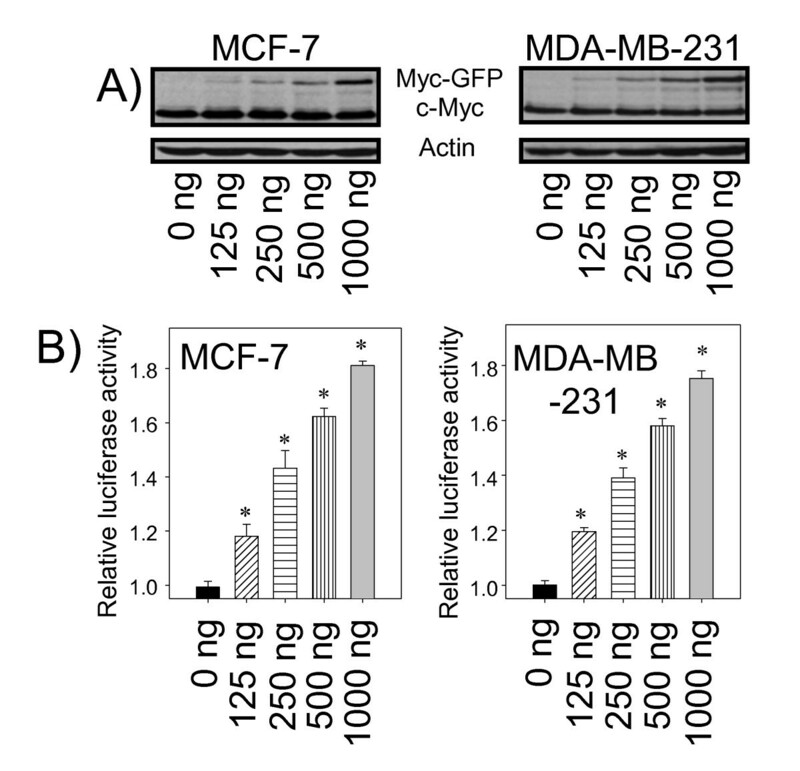 The activity of the BRCA1 promoters containing nucleotide substitutions in each E box was reduced compared to that of the wild-type in MCF-7 or MDA-MB-231 cells (Figure 5A or 5C, respectively). The promoter activity with double E box nucleotide substitutions was decreased to a greater degree (Figure 5A or 5C). To address the c-Myc dependent activation by Myc-GFP, we used an E box promoter/luciferase reporter construct, pMyc-TA-Luc, which contained six tandem E box consensus sequences inserted into pTA-Luc. The activity of the promoter containing E boxes (E box-Luc), induced by constitutively expressed Myc-GFP, was almost 3 times that of the promoter without an E box (-Luc) (Figure 5B or 5D, MCF-7 or MDA-MB-231, respectively). These observations and the results from the in vivo ChIP assay described above indicate that E boxes in the BRCA1 promoter region are sufficient for c-Myc dependent activation in cultured breast cancer cells. E boxes in the BRCA1 promoter are required for BRCA1 activation by constitutively expressed c-Myc. MCF-7 or MDA-MB-231 cells (A or C, respectively) were transiently co-transfected with Myc-GFP expression vector along with the BRCA1 promoter (pCYL42, FL) or its derivates with E box nucleotide substitutions (X, Y, or XY) as described in methods. Luciferase activities from cell lysates were determined 48 hours after transfection. The fold changes were normalized to the vector control and the full-length BRCA1 promoter activities set as 1. *: p < 0.01. The activation of a promoter/reporter construct containing six tandem E boxes (E box-luc) by constitutively expressed Myc-GFP was used as a control [B or D (MCF-7 or MDA-MB-231, respectively)]. Bars show mean ± SD. *: p < 0.01 as each indicated column compared to the FL column in A or C, and to -luc column in B or D.
BRCA1 is involved in chromosomal stability and it has been shown that BRCA1 deficient cells have impaired DNA damage repair . After showing that reduced c-Myc expression led to decreased BRCA1 expression, we tested whether depletion of c-Myc could abrogate the BRCA1-mediated DNA repair function. We adopted a well characterized GFP based double strand break repair assay to monitor DNA repair activity. In this system, screening cells for GFP expression following homologous recombination was used for testing DNA repair activity. 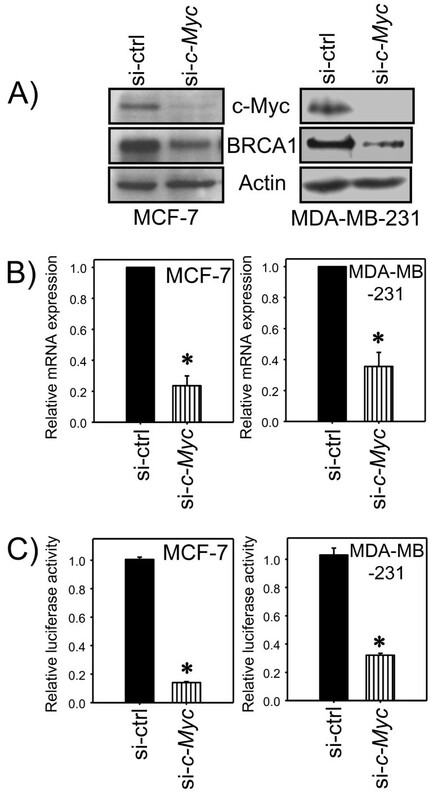 MDA-MB-231 cells were treated with c-Myc siRNA (si-Myc) to deplete c-Myc thus correlated with reduced BRCA1 expression, or control siRNA (si-ctrl) (Figure 1). Then the DR-GFP reporter system in various combinations was introduced into cells. 48 hours later the green fluorescence in the cells was monitored by a flow cytometer. The GFP positive cells were identified after the FL-1 (green fluorescence) vs FL-2 (orange fluorescence) ratio. The representative analyses for each condition of DR-GFP reporter system were depicted as A, B, C, or D and the summary of three triplicate experiments was shown in E. The control siRNA treated cells with intact BRCA1 exhibited considerable homologous recombination efficiency (HR efficiency) (Figure 6C, D, and 6E, si-ctrl). 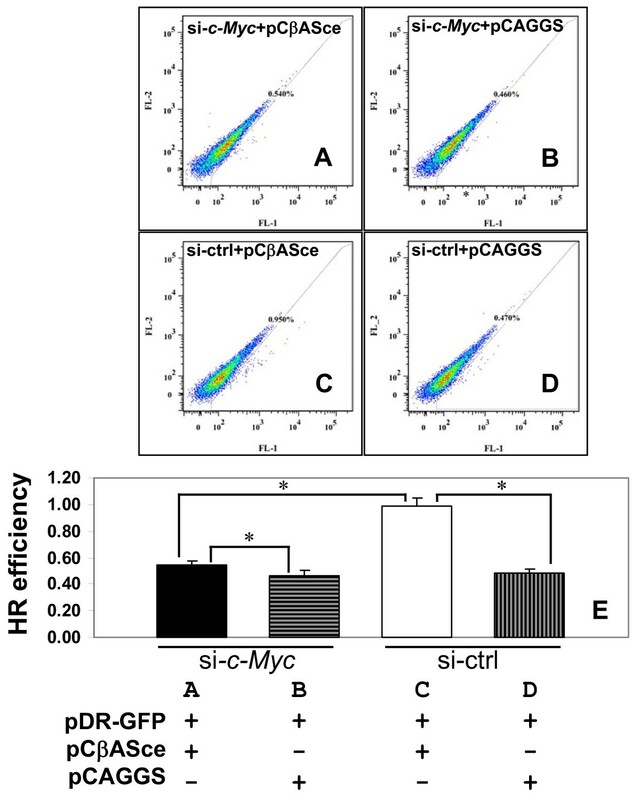 A significant reduction of HR efficiency was observed when c-Myc was depleted by c-Myc siRNA treatment compared to the cells with control siRNA (Figure 6A, C and, Figure 6E, black column vs blank column). A slightly higher DNA repair activity was evident between the cells in the presence of I-SceI and without I-SceI even both cells were treated with c-Myc siRNA (Figure 6A, B, and 6E, si-c-Myc), indicating cells still maintained HR activity at certain level even with reduced BRCA1. No significant difference in HR efficiency was found between c-Myc siRNA and control siRNA treated cells without I-SceI introduced DSBs (Figure 6B, D, and 6E, horizontal vs vertical lined column). Examination of HR activity using DR-GFP reporter. MDA-MB-231 cells were treated with c-Myc siRNA or control siRNA, then the DR-GFP reporter plasmids with different combinations were co-transfected into cells as indicated in E. The percentage of GFP positive cell was determined by a flow cytometer using detector FL-1 (green) vs FL-2 (orange), the HR efficiency represented as the frequency of GFP-positive cell. The representative analysis for each treatment depicts as A, B, C, or D along with the percentage of GFP positive cells due to gene conversion as E. Bars show mean ± SD. *: p < 0.01 as compared with paired groups indicated. In the present report, we used a targeted identification strategy for characterizing regulatory DNA elements to show transcriptional activation of BRCA1 by c-Myc through c-Myc's interaction with two E boxes in the distal BRCA1 promoter region. Genome-wide analysis has shown that c-Myc could bind to the regulatory regions of up to 15% of all human genes, and these data also indicated that c-Myc-DNA interactions were not sufficient for promoter regulation in some cases [35, 36]. Indeed, it has been shown that although c-Myc binds to the CCL5 gene promoter in both MCF-7 and MDA-MB-231 cells, c-Myc-dependent regulation of CCL5 was evident in MCF-7 but not in MDA-MB-231 cells. Consistently, gene expression profiling analysis has shown that the spectrum of genes regulated by c-Myc in these cell lines is intrinsic to each cell line . While the mechanism of how c-Myc functions in such a cell context-dependent manner is not clear, possibilities include, but are not limited to, post-translational modifications of c-Myc. For example, phosphorylation and acethylation of c-Myc could affect its protein-DNA and protein-protein interactions, which would contribute to its selective binding of target gene promoters. Recently Benassi et al. showed that phosphorylation of S62 of c-Myc could increase its binding ability to the promoter region of the γ-glutamyl cysteine synthetase gene . However, the conclusive connections between c-Myc-DNA binding abilities and c-Myc transcriptional activities in a given condition are still obscure, as in the case of the CCL5 gene. In this study, we identified two E boxes within the BRCA1 promoter region and provided evidence that these were necessary for c-Myc-dependent promoter activation in MCF-7 and MDA-MB-231 cells (Figure 1). Although the co-factors recruited by c-Myc to these sites were not elucidated in our present experiments, we speculate that it is highly likely that a c-Myc-containing transcription complex would play an important role in BRCA1 expression. Our data showed that BRCA1 activation by c-Myc only increased promoter activities by 1.8 fold under the conditions used (Figure 2B), and disrupting c-Myc-responsive elements (two E boxes) by different combinations correlated with loss of promoter activity ranging from 30-40% (Figure 5A and 5C). This observation is consistent with a previous report that BRCA1 mRNA expression was detectable in c-Myc knockout c-Myc -/- Rat1A cells, and expression of c-Myc by serum stimulation in the parent c-Myc +/+ Rat1A cells slightly increased BRCA1 mRNA expression . BRCA1 expression activated by c-Myc could be the final outcome of the interplay within multi-component transcriptional networks containing factors important for breast tumorigenesis. It has been shown that HIF-1α transcriptional machinery activated by hypoxia signaling pathway abrogates c-Myc activation of BRCA1 expression in colon cancer cells . c-Myc activates the expression of p53 through an E box within the p53 promoter . On the other hand, p53 represses c-Myc transcription by binding to the c-Myc promoter and recruiting the general repressor mSin3a; this repression is required for cell cycle arrest and differentiation but not apoptosis . In addition, p53 up-regulates ER-α by increasing gene transcription . c-Myc is up-regulated by activated ER-α and plays a critical role in enhancing estrogen-induced breast cell proliferation [43, 44]. Although not directly mediated by the ER-α pathway, estrogen stimulation up-regulates p53 expression . Thus, further studies to elucidate transcription factor occupancy on the BRCA1 promoter, including proximal and distal regions, in breast cancer cells with distinct molecular signatures would be critical to understanding the complex regulation of BRCA1 expression during tumor progression. Accumulating evidence has demonstrated that BRCA1 is a major component of the DNA damage repair complex required for normal cellular processes. Depletion of BRCA1 has been associated with decreased DNA damage repair and increased chromosomal instability . In order to maintain the basal level of DNA damage repair, BRCA1 may be required for c-Myc associated cell proliferation. In this report we show that c-Myc can activate BRCA1 expression in breast cancer cells, and depletion of c-Myc reduced BRCA1-dependent DNA repair. However, the complicated interaction between c-Myc and BRCA1 may be cell context dependent. In breast cancer patients, c-Myc amplification was found more often in patients with BRCA1 deficiency than in patients with normal BRCA1 , suggesting that c-Myc amplification could be linked to decreased BRCA1 but the mechanism is poorly understood. These data suggested that c-Myc overexpression and BRCA1 loss seemed highly correlated in a large portion of basal-like breast cancers. This could indicate that loss of BRCA1 with c-Myc overexpression might lead to the development of basal-like breast cancer. Interestingly, we have reported that reduction of BRCA1 expression could be due to BRCA1 promoter methylation . c-Myc has been shown to recruit DNA methyl transferases such as DNMT3a to repress p21Cip1 gene expression . It raises the questions of c-Myc's involvement in the DNA methylation complex in breast cancer cells; particularly if BRCA1 is a target. It is worth noting that aberrant expression of DNA methyl transferase or its alternative splicing forms have been detected in cancerous cells, and could affect the distribution of DNA methylation . Although our data support a model in which BRCA1 expression is regulated by transcription factors, such as c-Myc, it has been shown that other mechanisms could also affect BRCA1 expression. Epigenetic regulation such as BRCA1 promoter methylation has been shown to account for BRCA1 loss in 10-31% of sporadic breast cancer tumors . The accessibility of transcription factors to the methylated BRCA1 promoter is reduced, and consequently the expression of BRCA1 mRNA and BRCA1 protein is decreased . On the other hand, nucleosome occupancy has been identified as an alternative means to regulate BRCA1 expression . Taken together, chromatin structure, methylation status of the gene promoter and dynamic transcription factor recruitment may work together to affect BRCA1 expression in breast cancer cells. Newly identified regulation by means of microRNA could also play a role in BRCA1 expression at the translational level. Aberrant expression of a set of microRNAs have been found in breast tumor samples, and some of these microRNAs could target BRCA1 mRNA , thus possibly regulating BRCA1 expression. Previous data from our lab and others have shown that BRCA1 expression in breast cancer was regulated at epigenetic and transcriptional levels. The data presented here suggests c-Myc is a novel member of transcription activators for BRCA1 expression. This study showed that the E boxes in the distal BRCA1 promoter region contribute to BRCA1 gene activation, and this activation is dependent on c-Myc. Our data suggest a transcriptional link between c-Myc and BRCA1, which has consequences for BRCA1 dependent-DNA damage repair. Yinghua Chen, Jinhua Xu contributed equally to this work. We are grateful for help from Dr. Greene's laboratory for the luciferase assays, and Dr. M Jasin for plasmids used in gene conversion assay. We thank Michelle Porcellino and Lise Sveen for critical reading of the manuscript. This work was supported by National Institute of Environmental Health Sciences grant P50 ES012382, NIH-National Cancer Institute Cancer Center Support grant 3P30 CA 23074, the Breast Cancer Research Foundation, the National Women's Cancer Research Alliance, and the Falk Medical Research Trust (O.I. Olopade). YC and JX designed and conducted the experiments, and wrote the manuscript. SB and CC performed experiments, and DH participated in the experiments and conducted the statistical analysis. OIO conceived the study, participated in its design and coordination, and helped to draft the manuscript. All authors read and approved the final manuscript.